Improving as an individual and helping others grow—the LRN (Learn) tenet in my philosophy—has been a very important driver for me throughout my life. One LRN technique I began using in the early 1990’s is what I call my Project of the Month. This technique gave me an opportunity to branch out into new learning experiences and become a more well-rounded person. Presenting an overview of the technique. Giving examples of several topics I have used for the Project of the Month. Providing some tips for implementing this technique in your life. I hope this post gives you some motivation and ideas to incorporate the Project of the Month into your life and into the lives of your family and friends. The purpose of the Project of the Month is straightforward: learn something new by focusing on it for a month. Why something new? There are several reasons. One reason is that you grow much more in topics you do not know because almost everything is new. A second reason is it forces you to get out of your “comfort zone”, stretching and challenging you, which enlarges your comfort zone once you have gained experience. And a third reason is it makes you a more well-rounded person. Well-roundedness usually helps with learning (you learn better how to learn), analysis and problem-solving (you are able to apply knowledge from one area to another), and tolerance (exposure tends to lessen prejudice and give greater appreciation for diversity). When I started the Project of the Month I set only one ground rule for my projects: the something new should have nothing directly to do with work or the field I was in. This excluded management consulting and information technology, areas I was already focused on daily through reading, doing, experiencing, and applying. This ground rule forced me to think beyond my narrow walls and branch out. Why a month? A day or even a week is not usually sufficient time to get engaged deep enough into a topic and obtain knowledge and experiences that can stay with you and be applied throughout your life. There are days in a month where other priorities take precedence, so a week can quickly go by without much opportunity to explore a topic. A month is sufficient time to focus on something new. It also gives you twelve different project opportunities throughout the year. As you will read in the tips section, the month timeframe is a guideline. Why the focus? In childhood, formal schooling provides structured learning opportunities. Children absorb new information, gain knowledge, and have new experiences during their school years and in structured after-school activities and summer programs. As adults, we are not automatically provided many structured learning opportunities. "Daily life" gets in the way, and we have to be much more proactive in making the time and effort to grow as a person. The Project of the Month formalizes the opportunity and gives focus to a particular topic of your choosing. Many of the Project of the Month topics I have selected over the years are in the traditional creative arts. I enjoy creating or building something with my hands, and I like the creativity associated with these crafts. I also enjoy traveling and have made every non-work trip a project. Here is a listing of just a few of my projects over the years, how I selected them, and some of what I learned from them. Pottery making I saw a flyer about pottery classes held in a studio about a mile from where I lived. I read a book on pottery making and took classes at that studio on the weekends. I learned techniques for pottery making, learned how to use a pottery wheel, and explored the art of glazing. Classical French Cooking A friend at work suggested we take weekend adult classes at the Culinary Institute of America in Hyde Park, New York. We had four or five Saturdays in which we cooked all morning and then ate our creations at lunchtime. I learned kitchen knife techniques, prepared a lobster bisque and other dishes, and was introduced to a professional kitchen and walk-in refrigerator. I also learned a three-ingredient French dish could take many steps and over an hour to prepare. Origami I do not remember the specific event that inspired me to learn origami, but I have been a fan of it ever since. I bought books and origami paper and made several pieces that month. I attended an origami club meeting where the members made origami in a group setting so you could learn from others. I learned how to read origami instructions and created several pieces. I have shared this interest with many children and adults. Outward Bound experience A colleague at work put an Outward Bound catalog on my desk with a note that I should check it out. I had recently done sky diving and she felt this would be another adventure opportunity. 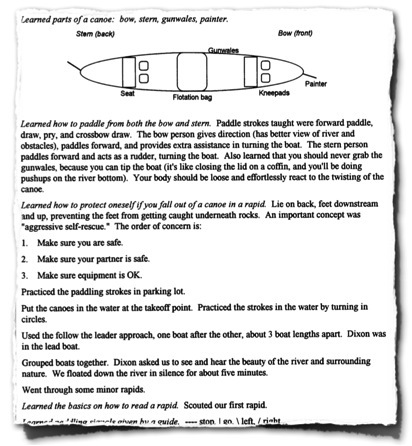 I learned about camping, how to read a rapid, and how to use a compass and a contour map. I gained new experiences regarding teamwork and team dynamics. I also acquired a greater appreciation and love of the outdoors and adventure travel. Knitting I saw two women at work at lunchtime knitting and was fascinated with the idea of turning one long strand of yarn into a beautiful object only using two sticks. (Note: This is similar to turning an ordinary piece of paper into a work of art through origami.) I asked one of the women to teach me. I selected a pattern (a vest, Fair Isle, two colors per row), bought yarn and needles, and had two brief lessons on how to cast on and knit. I learned knitting techniques and how to read patterns, and I gained a greater appreciation of the art form. Knot tying I am a big fan of Klutz books (some of them have made excellent Project of the Month topics for me) and saw their book with holes in the cover and two pieces of red and blue cords. I purchased the book and made it a project. I learned technical terms such as bends (tying two lines together) and hitches (tying a rope to an object), and I practiced tying all of the examples throughout the month. 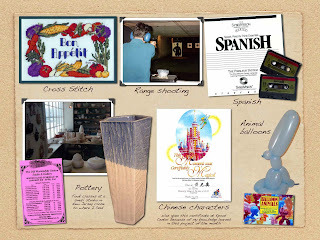 Here are some more of my past projects: Piano, harmonica, tennis, range shooting, figure drawing, watercoloring, charcoal drawing, animal balloons, fiction writing, cross-stitch, skydiving, strength training, paper airplanes, chinese characters. Here is a page from my life scrapbook with examples. I am working on my current Project of the Month (for December 2010) with my girlfriend Grace. We are exploring the breadth of natural history, from the earth and climate to minerals and rocks to fungi and plants and animals. How did this topic come about? In October I visited Washington, DC, USA, and spent a good part of a day in the Smithsonian National Museum of Natural History. In November I discovered and purchased a book by DK Publishing called Natural History (Smithsonian) (here is a link to the book summary). We are going through this book page by page, reading and discussing, spending about 30 to 60 minutes most evenings. Simple? Yes. A growth experience? Tremendous. And this formalized learning experience touches all aspects of my LRN LAF LUV LIV philosophy. Pick topics that interest you. When you enjoy something, you will be more engaged in the experience, be more appreciative of it, and learn more from it. But do not use it as an excuse to limit your topics to areas you already know or avoid topics you think you may not like. Use each Project of the Month as an opportunity to expand your mind, challenge yourself, and have new experiences. Ask knowledgeable people to help you. One of the best ways to learn is from people who are knowledgeable in your topic. Oftentimes, they are more than happy to share their passion and their knowledge. You may have a neighbor that does stain glass making as a hobby. I did and he invited me over to his home to show me his workshop, works of art he had made, and tips on how to design patterns. I learned knitting from a co-worker. Share your Project of the Month. 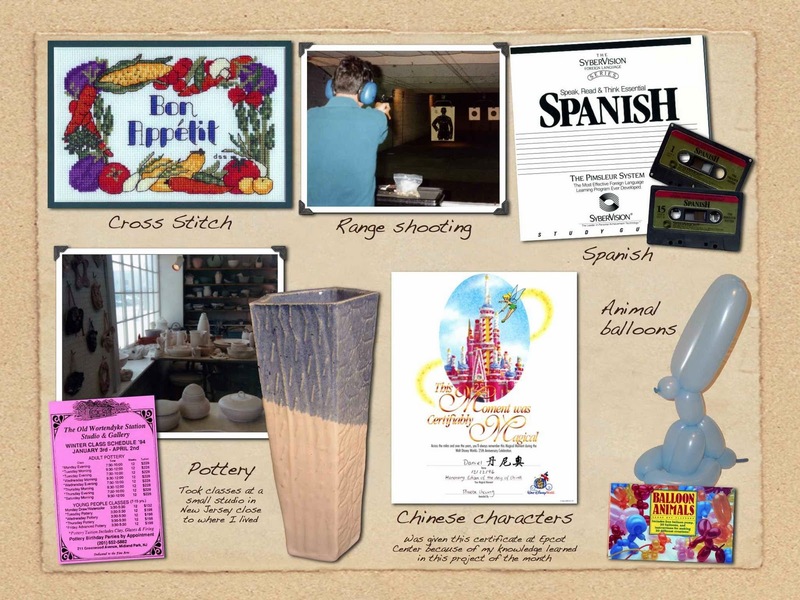 In the early to mid-1990’s I displayed on my office walls at work the topics of my past and current projects. I was pleasantly surprised to find out how many of my colleagues were knowledgeable or interested in the topic I had chosen. If you let a friend, neighbor, or colleague know your Project of the Month, it can become a conversation piece and a learning opportunity for both of you. You may learn something new from the other person. It may also give you the opportunity to share what you have learned with those that are interested in the topic. Sharing allows you to apply your knowledge, and you gain more knowledge every time you teach someone what you have learned. Pick topics that are inexpensive. Some of my projects did cost money, whether it was for supplies, traveling, or taking a class, and I was fortunate to have the money available. But many things can be learned at low or no cost. Borrowing books from a library, reading materials and watching videos on the internet, speaking with friends and colleagues, and doing volunteer activities provide many opportunities for learning. Use "month" only as a guideline. The guideline gives some structure to the length of time and serves as a built-in reminder each month. Do not be insistent that a project has to start on the first of the month and end on the last day of the month. Learning should not wait. If you have a topic that interests you or an opportunity that would make a perfect Project of the Month, start when you are ready. Some projects will take more than a month. Do not stop a project if you are enjoying it and learning from it. Make it a two-month project if it is so engaging. I continued my knitting for a year while doing other projects. Strength training is a life-long activity, but you can focus a project on learning new exercises during the month and then apply those the rest of your life. I want to emphasize that a month is a sizable amount of time to learn something meaningful if you give it the focus. While it is true you cannot learn how to play the piano like an expert in a month, it is amazing how much you can learn if you practice each day. I used a 30-lesson tape series over a 30-day period to practice Spanish, and I improved my Spanish significantly during that time. Extend the learning period of your trips and one-time events. My Outward Bound trip was one week. But I made it last more than a month through preparation before and reflection after. I researched the type of clothing I needed to bring and investigated Outward Bound before the experience. When I got home after the trip, I documented the experience, looked through the photographs I and others had taken, and sent letters and pictures to the people I met on the trip. This tip can be done with almost any event, such as a day-trip to an art museum (delve deeper into an artist or an art style before you go and after you come back) or to a concert (learn more about a composer or musical genre). Your experience will be much more enlightening. Do a Project of the Month with someone else. This can be helpful if you sometimes lack the self-motivation to do something on your own. Just make sure you do not use it as an excuse if you cannot find someone to partner with or if your partner backs out. This tip can also be helpful for parents with children. You can learn, do, and experience topics together, turning play or chore time into an enriching experience. My December 2010 project allows me and my girlfriend to spend quality time with each other and broaden our knowledge together. Document what you have learned. You can do this through personal journals, blogs, or simple notes you write down or type. The act of writing helps you formalize what you learned and make it concrete. You can then refer back to it later on when you want to recall a key learning. 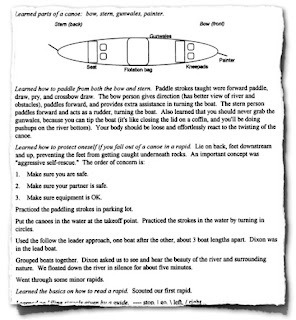 Below is an example of one of the pages of a document I wrote detailing the activities and my key learnings from my Outward Bound trip. Apply and share what you have learned. Knowledge gained without applying it does not do much good to yourself or others. Ideally, knowledge should improve you as a person and give you more wisdom to make proper decisions and give good advice. Applying or sharing even a small amount can be beneficial. I have used some of the knots I learned several times (and knew which type of knot was most appropriate and safe to use). I have taken my experiences in Outward Bound and applied them to many other trips. I have shared some of the origami pieces I learned to delight children of all ages. And somehow I feel all of these Project of the Month learnings have made me a better and wiser person. Please feel free to send me a message with your Project of the Month. 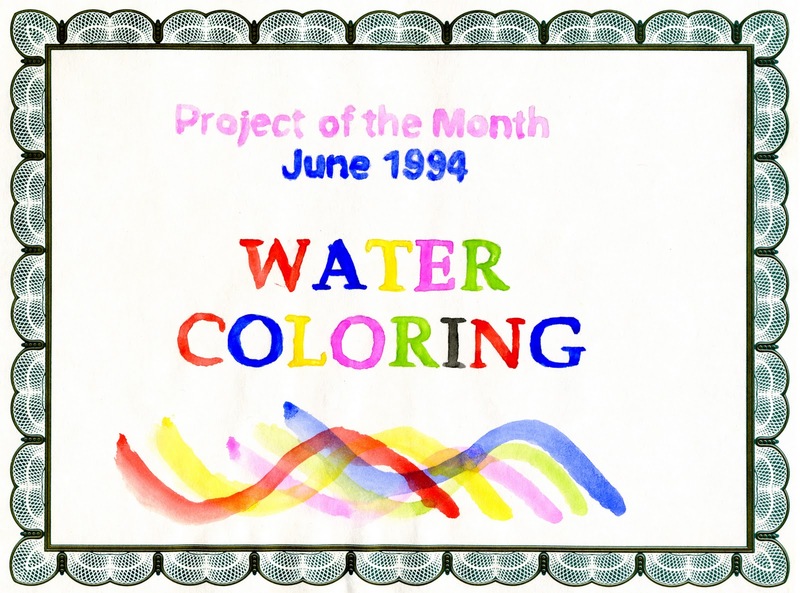 Happy Project of the Month-ing!